The Diving Safety Program promotes awareness of the unpredictability of the marine environment and to prepare divers to practice the proper safety procedures, consistent with nationally recognized standards, in order to prevent and/or respond to the health and safety challenges likely to be experienced in FIU sanctioned scuba diving activities. The purpose of the Diving Safety Program is to ensure that all FIU research related diving is conducted in a manner that will maximize protection from accidental injury and to set forth standards for training and certification for FIU personnel and their affiliates. All PIs, Lead Divers or Diving Supervisors must submit the new FIU Dive Plan (001 Rev-1 Apr_2019) to the DSO. 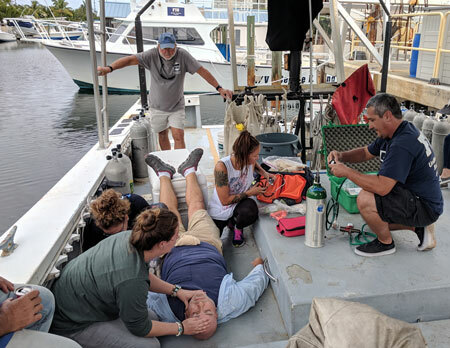 As part of Dr. Yannis Papastamatiou’s Predator Ecology and Conservation Lab’s Shark Handling Workshop, the Medina Aquarius Program held its first trauma class for researchers at FIU. The class provides an in-depth discussion on traumatic injuries and hands-on training on important skills such as, taking vital signs, proper tourniquet application, the use of hemostatic agents, and responding to bleeding and shock. View the latest class schedule of the scientific diving courses. The CPR/First Aid/AED courses are extended to the entire FIU community as well. More information on training can be obtained at the Scientific Diving Training web page. In 2013, FIU acquired Aquarius Reef Base, underwater research laboratory that sits in 60 feet of water off of Islamorada. FIU’s Diving Safety Officer, Roger Garcia, is also the Operations Director of Aquarius. The Dive and Boat Safety Office monitors all scientific diving and boating operations conducted by FIU. When compared to over 100 other institutions affiliated with AAUS throughout the world, FIU ranks among the top 10 in underwater research activity. Each year, an average of 30 divers performs over 1000 dives and 45,000 minutes of underwater time! Approximately 900 boating missions take place annually as well. In all, there are over 100 researchers participating in marine research annually at FIU! If you have any questions regarding the Diving Safety Program, please contact the Diving Safety Officer Roger Garcia. He can also be reached at: (305) 664-2916.